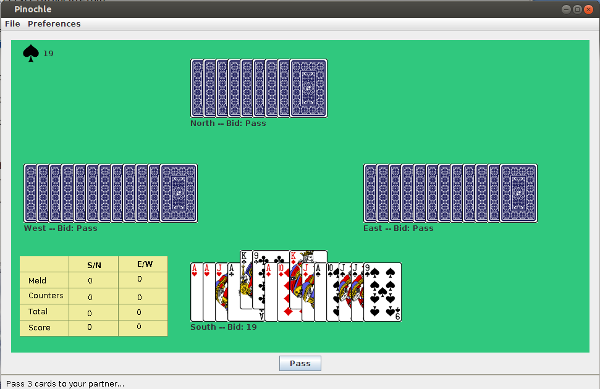 This page describes how to play JoeDog’s Pinochle, a computerized version of the classic card game. To learn how to play the card game itself, see Pinochle: Rules of the Game. 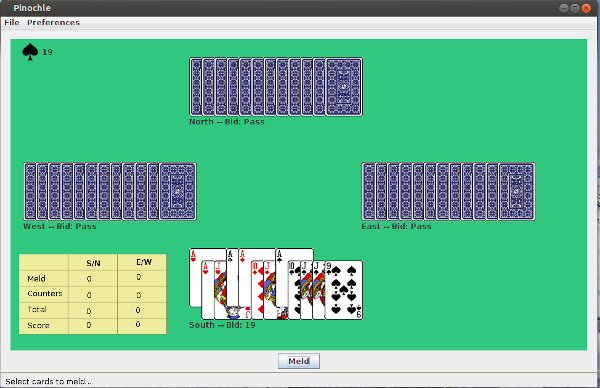 JoeDog’s Pinochle is a computerized card game written in java. The latest version is available here: Pinochle. Right-click the link and download it to your desktop. In order to run the game you’ll need to have java installed on your computer. If you don’t have java, you can download it from Oracle. 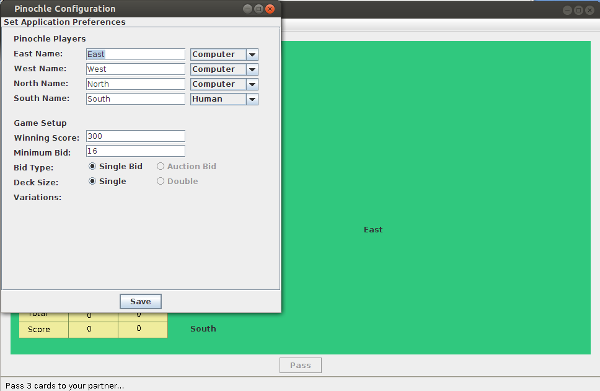 If java is in your $PATH (or %PATH% if you have Windows, you should be able to double-click the file and run the game. The first time the game runs, you’ll be asked to configure it. There are a few additional options to configure like Winning Score, Minimum Bid, Deck Size, etc. If an option is grayed out, then it’s currently not available. In the example above, Double deck is grayed out. That means it’s a place holder for a future option. Be patient – I want double-deck pinochle as much as you. After you configure the game, click the “Save” button. Once you save the configuration, you’ll never have to deal with this window again. But if you want to change things (and you should check this screen when new versions are released), click on “Preferences => Configure… ” or type ctrl-c. Here we’re playing auction bid. In this example the next highest bid is 17. To make that bid, click “OK” To pass the auction, click “Cancel”. If a player tops your bid, the auction will come around to you again. When that happens, you’ll have another opportunity to outbid the competition or pass. The auction is complete when all but one player passes. The player with the highest bid gets to name trump. 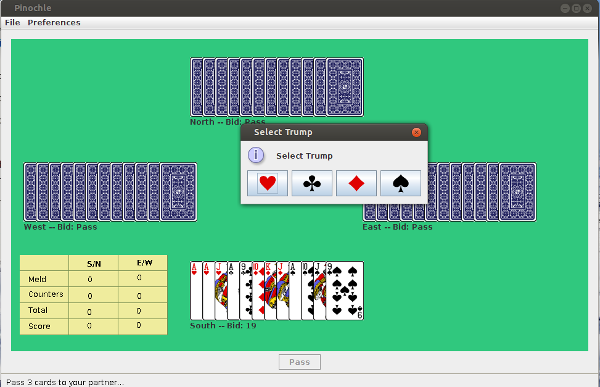 If a computer player gets the highest bid, a card suit symbol will appear in the top left corner to signify which suit designated trump. A number will appear beside the suit. That represents the winning bid. It is the score the bidding team must make in order to keep their points. Failure to make the bid will result in a “ride.” A team that rides is scored a negative bid. In this game, we’re doing a pass option. The team that names trump gets to pass three cards to their partner. Let’s imagine an example to show how it works. South won the bid with 19 points. Since South took the bid, his North passes three cards to his partner which is you, the human player. After you receive those cards, you’ll have three more than any other player. To even the hands, you must pass three cards back to North. How do you do that? Select the cards you wish to pass by clicking them with your mouse. When you select a card, it will pop up higher than the rest of the cards in your hand (see screen shot below). Once you’ve selected three cards, the Pass Button will become enabled. If you select more than three it will be disabled again. When you’re finally ready to pass, click the Pass button. Once you do that, all players will hold the same amount of cards are you’re ready to play the hand. The next phase of a pinochle game is meld. This is when you are awarded points for card combinations that you lay on the table. JoeDog’s meld behaves a lot like the pass phase. You select the meld combinations in your hand. When a card is selected, it will pop up above the other cards. Once you’ve selected every card you plan to meld, you’ll hit the Meld button. Life isn’t fair. Sometimes you’re dealt poor hands. Some of those hands may not contain any meld. If your hand has no meld, you still have to hit the Meld button in order finish this phase of the game. Once you hit, Meld all the meld on the table will be revealed to you. You’ll see your opponents’ meld and they’ll see yours. The computer will remember the cards you’ve melded and try to use that knowledge to its advantage. But it only knows what you put on the table. It can’t “see” the cards that remain hidden in your hand. If you’re new to pinochle and don’t know the melding pairs, you can certainly display every card in your hand. The computer will meld your cards for you. Just remember, if you throw every card on the table, your opponents will remember them…. In the screen shot below, we see what happens after you hit the Meld button. 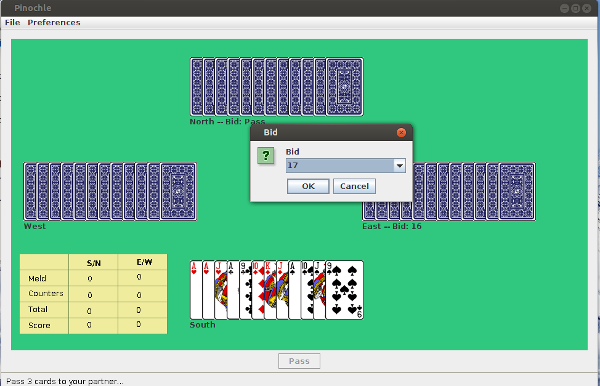 The aces round you selected in the previous screen shot is laid out on the table. Remember when when we said the computer can “see” your meld? 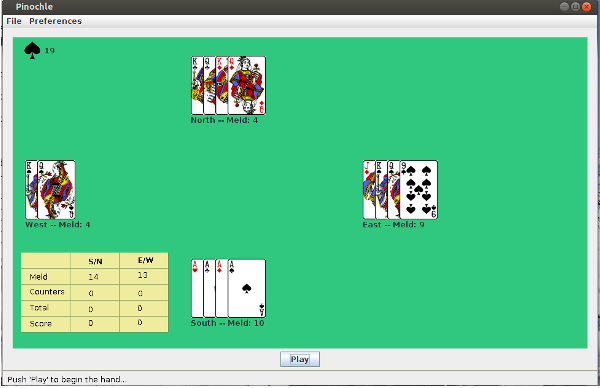 In this example the only cards it “sees” are the four aces you laid on the table. The remaining cards in your hand are hidden from view. At this stage we can also see our opponents’ meld. As the computer remembers your cards, it would behoove to remember theirs. For example, you know your Ace of spades is a safe play because both your opponents have spades. When play begins, you will be prompted to place cards into the trick on the table. You can see the prompt on the left side of the bottom gray bar. In this case it says, “South, it’s your turn. Clubs was led.” This means if you have Club you must play it. If not, you must throw trump or play off if you have none. 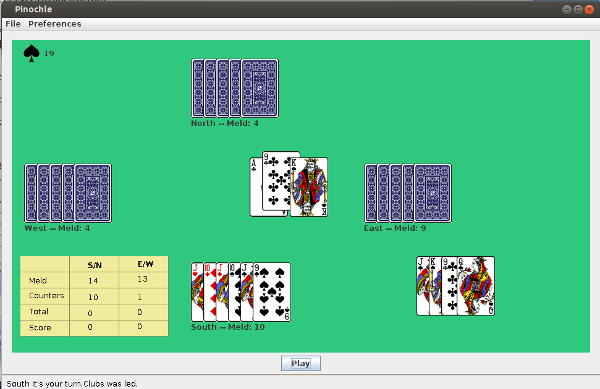 The rules of play are enforced by the computer. If you do something illegal, it will call you a CHEATER and ask you to make a proper play. To play a card, simply click the card you want to throw and it sail into the middle. You can tell who played which card by its position in the trick. East and West’s cards appear closest to them. North’s card is slightly elevated. So even though we haven’t seen this trick, we know by is positioning that West played the Ace, North played the Nine and East played a King. When you throw a card, it will appear slightly popped down so its closest to your position.